Thousands of women who lit up the streets of Bury St Edmunds while wearing their pyjamas and flashing bunny ears have raised a six-figure amount for St Nicholas Hospice Care. The Hospice, which works to ensure people are informed, equipped and able to live with dying, death and grief, announced the official total for its 2018 Girls Night Out walk this week (Monday, 4 February) as £226,643, and there is still sponsorship and Gift Aid money to come in. The charity also thanked the walkers, volunteers, supporters, who make the much-loved annual walk through Bury St Edmunds a great success. Jenny Smith, the Hospice’s events manager, said: “This was our tenth Girls Night Out and my oh my it was a good one. The figure of £226,643 is made-up of the money walkers raised as well as generous support and sponsorship from local businesses including main sponsor JM Finn, who will also be the event’s main sponsor this year. Brett Bayliss, investment director and head of the Bury St Edmunds branch of JM Finn, said: “This is the third year we have been able to support the hospice with Girls Night Out, which has become a regular date in our calendar as well as the thousands of women and girls that take part. 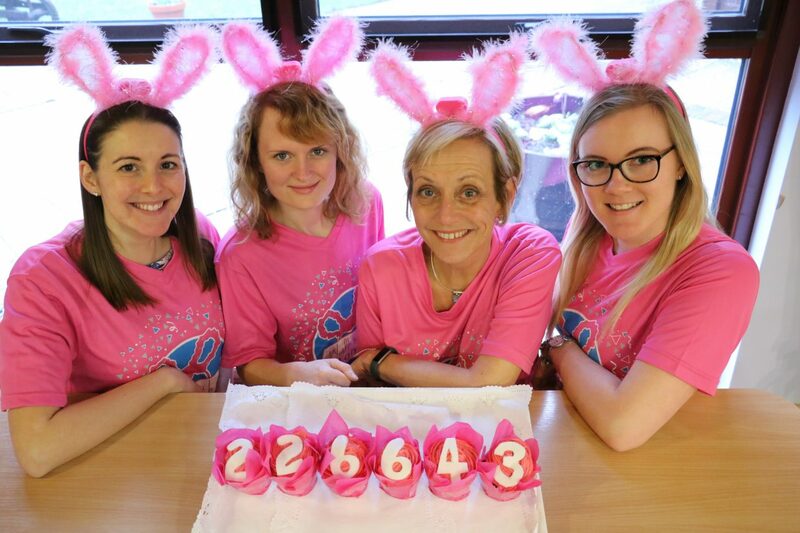 The efforts of 2018’s Girls Night Out walkers, some 2,000 who proudly donned their flashing bunny ears while completing either 11.2 or six miles around a moonlit Bury on 8 September, will help the hospice provide a range of support services in the community and specialist care on its ward. Charlie De-Moore, the hospice’s events fundraiser, said: “Girls Night Out is the hospice’s biggest fundraising event and the whole evening comes alive with community spirit. “We are so pleased JM Finn have decided to support us by becoming the event’s main sponsor for the third year in a row. Registration for Girls Night Out 2019 opens on Friday, 5 April. As in previous year’s walkers will be able to sign up at a discounted early price of £10 until 31 May. With all entries after this date costing £15.